Abu Dhabi: The UAE has announced that it will welcome 15,000 Syrian refugees over the next five years with the aim of sharing the responsibility of addressing the Syrian refugee crisis. More than 4.5 million refugees from Syria are in just five countries — Turkey, Lebanon, Jordan, Iraq and Egypt, according to UN Refugee Agency (UNHCR). The UAE is not a signatory to the UN Convention on Refugees which has governed international law on asylum since World War Two. The convention defines the status of refugees and the duties and rights of governments. Although it is not immediately known whether the Syrian refugees will be given the status and rights as stated in the convention, Al Hashemi stressed the UAE believes that it must not just meet the basic needs of refugees, but it also maintain their dignity and offer hope for their future. “In refugee camps that the UAE has set up in Jordan, Northern Iraq, even in Greece, we provide the basic life-saving support such as shelter, food, basic health, water, and sanitation. We are also looking to address often neglected services like rehabilitation, education in emergencies, cash for food and work, vocational training, and care for those with mental illnesses,” the minister said. Al Hashemi added: “The UAE strongly supports the humanitarian efforts of regional and international organisations, and we commend the United Nations’ leadership in bringing Tuesday’s New York Declaration to fruition. “This is an important step forward, which must be complemented by a dedication to preventing wars and conflicts, currently the main drivers of forced migration. We all must do our part to engage in dialogue, resolve differences and support global pillars of peace and stability. Ultimately, we must offer a source of hope for displaced persons that allows them to maintain dignity, return home, reintegrate themselves into their societies, and rebuild their countries and their lives. “This takes a simultaneous development and humanitarian approach, where we consider both near-term urgency and the tools for longer-term empowerment. Over the last five years, the UAE has provided more than $750 million to support Syrian refugees, mainly in neighbouring countries that are facing considerable pressure. Dr Ebtisam Al Katbi, chairwoman of Emirates Policy Centre, said the initiative is not new for the UAE and its leaders especially the founding father late Shaikh Zayed Bin Sultan Al Nahyan. Dr Al Katbi said Shaikh Zayed had been a beacon in humanitarian work and that his generosity was followed by President His Highness Shaikh Khalifa Bin Zayed Al Nahyan and other Emirati leaders. “The Founder of the UAE and his fellow founding fathers were keen to make humanitarian work a cultural and immortal value in the hearts of the people of the UAE,” Dr Ebtisam said. Praising the UAE’s gesture, Dr Abdul Khaleq Abdullah, a leading Emirati political analyst, said it might be timely for the GCC countries to go the extra mile and sign the UN Convention on Refugees. However, Dr Hassan Qayed Al Subaihi, professor of mass communications at the UAE University, believes it is premature for the GCC countries to sign the Convention on Refugees. “Culturally, the Gulf states rarely grant citizenship to foreigners. In this way, these countries believe they can protect their native population, often small in number, and their right to benefits from valuable natural resources,” Dr Al Subaihi said. Receiving refugee status in European states gives migrants the right to stay in the country indefinitely, guarantees access to social support, accommodation, schooling for children, language courses, and help with training for the job market. More than 4.5 million refugees from Syria are in just five countries: Turkey, Lebanon, Jordan, Iraq and Egypt. Turkey hosts 2.5 million refugees from Syria, more than any other country worldwide. Lebanon hosts approximately 1.1 million refugees from Syria which amounts to around one in five people in the country. Jordan hosts approximately 635,324 refugees from Syria, which amounts to about 10% of the population. Iraq where 3.9 million people are already internally displaced hosts 245,022 refugees from Syria. Egypt hosts 117,658 refugees from Syria. The UN’s 2015 humanitarian appeal for Syrian refugees was just 61% funded by the end of the year. Funding shortages mean that the most vulnerable Syrian refugees in Lebanon receive just $21.60 per person per month or around 70 cents a day for food assistance, well below the UN’s poverty line of $1.90. 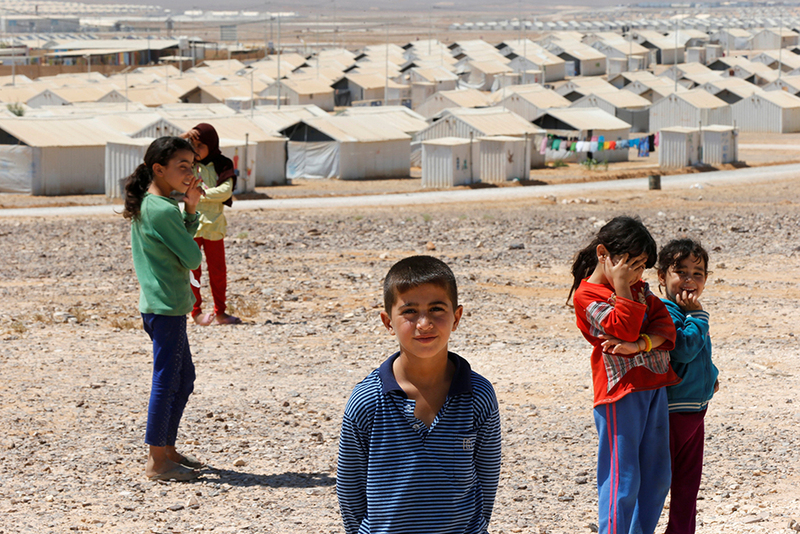 86% of Syrian refugees in urban areas in Jordan are living below the local poverty line. According to the UN, around 250,000 people have been killed and 13.5 million people are in urgent need of humanitarian assistance inside Syria. More than 50% of Syria’s population is currently displaced. One-in-every-two of those crossing the Mediterranean this year — half a million people — were Syrians escaping the conflict in their country. In total, 162,151 resettlement places have been offered globally since the start of the Syria crisis, which equates to a mere 3.6% of the total population of Syrian refugees in Lebanon, Jordan, Iraq, Egypt and Turkey. At least 450,000 people in the five main host countries — or 10% — are in need of resettlement according to the UN Refugee Agency, UNHCR. Amnesty International is calling for at least 10% of Syria’s most vulnerable refugees to be offered resettlement or other forms of admission by the end of 2016. Germany has pledged 39,987 places for Syrian refugees through its humanitarian admission programme and individual sponsorship; about 54% of the EU total.